All the comics in Seconds are primarily made in Second Life, the other Hypergrid and virtual worlds, using "crews" of avatars to pose for and shoot the images used in each panel. This is called by some a Machinicomic. for different scenes and stories. The Crew is sometimes assisted by friends and others who appear as extras in the background or various characters (e.g. Janey). 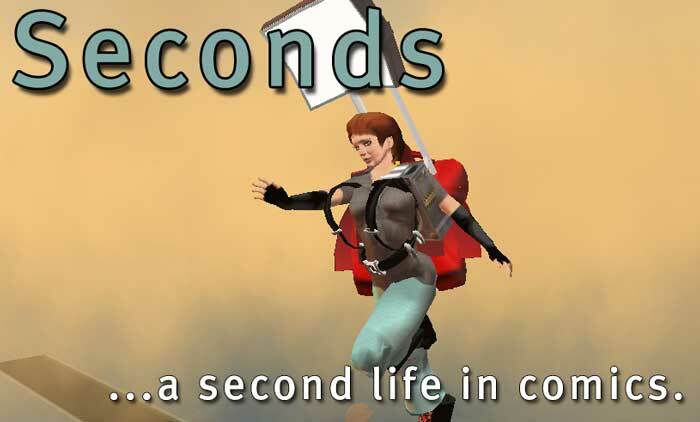 The initial full length story, Return to Second Life, is about what happens when avatars meet their owner in-world. Future stories may or may not be connected to this storyline. Sometimes an extended hiatus ocurs due to the creator's health - real life gets in the way. General schedule is about one page every two days when in production. There may be periods of apparent inactivity while new stories are scripted, locations sourced, sets built, and costumes and characters are created or changed for future shoots. other additional pages detail specific topics, such as: Crews, Working in groups to make webcomics; Sourcing, Finding things for your production; Characters, How to make multiple characters easily; Locations, Finding places to shoot in; Sets, Building and deploying sets; Shoots, Making, and editing images for the webcomic; Props, Making and modding props for use in shoots; Join in!, Come help make this webcomic. ; Credits, Who did what; and Links, Hyperlinks to other resources and interesting sites.